For retailers, optimization is not just about increasing conversion rate or average order value; in fact, many retailers have realized that optimizing for more than conversion rate and AOV are going to be critical to winning in ecommerce. Take Brooks Running for example. The running company recently examined purchase pattern behavior of customers that returned merchandise and tested how to improve customer satisfaction and revenue by anticipating and preventing shoe returns. Why focus on returns and not conversion rate? Because returns come at a cost — a cost of time, money, and opportunity for both the company and the customer. It can take several weeks before the customer ships the return, Brooks reprocesses the SKUs and restocks the shelves. Furthermore, returning is bad for the overall customer experience and an item returned means that other customers looking to buy may get out of stock messaging when the item they wanted is working its way through the exchange process. Nobody likes returns. Even if they’re free, returns are a pain for customers and eat into margins for retailers. So how do you create an experience that customers are satisfied with and are less likely to make a return? 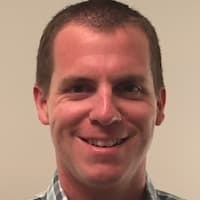 Brooks found that it’s a combination of understanding the unique consideration cycle for each product, tracking the right data and using Optimizely to provide a targeted experience to the right customer segment. The Brooks team started by looking into high-value orders. At a glance, high average order value is a good thing and many retailers strive to increase this metric. But a high value of the wrong products may be problematic. The team saw a pattern in these big orders: many of them were for shoes of the same model, just a half size or width apart. Examining the data, the team saw that statistically, when someone buys two or more pairs of shoes within half a size or width difference, at least one of those pairs will be returned. The shopper is actually searching for the best fit. In this case, high AOV is not a good thing. Knowing how costly returns are, the team focused on decreasing returns for these orders. When considering the challenge to decrease return-rate among the segment of shoppers buying similar sizes of the same shoe, the team channeled the in-store experience for inspiration. What do you do when you need help with sizing? You speak to a sales associate. So they decided to bring the real life experience online. 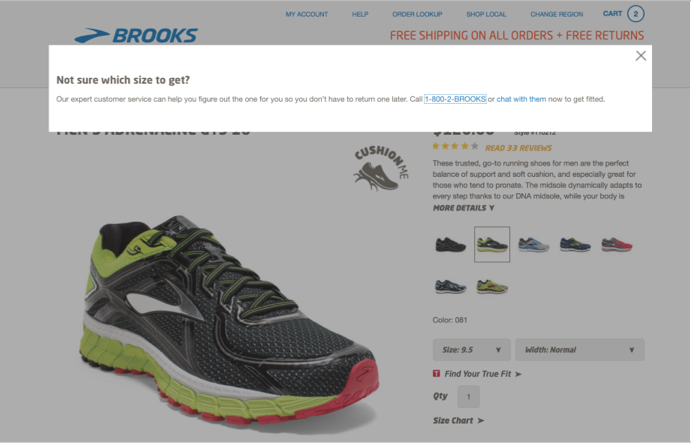 Brooks showed this pop-up message to shoppers who had 2 or more pairs of shoes in a cart that were half size apart. The campaign performed incredibly well. For the test segment, return rate declined nearly 80%. Not only did Brooks have more product in stock, but customers appreciated the personal touch, with 88% saying they appreciated the customer service offer to help. Conversion rate increased slightly by 2% which the team believes is due to less webrooming—when shoppers look up products online, then choose to buy them in a physical store—since the customer service reps were able to address size concerns upfront. In line with their expectations, AOV decreased, yet add-on rate of ancillary products increased, perhaps due to purchasers not having to wait on return credit to complete their running gear collection. Brooks also measured the cost of customer service time — is having humans answer shoppers’ questions more expensive than the cost of returns? They found the answer to be no. Customer service engagements averaged five minutes, which was less expensive than the hard costs of fulfillment and return shipping on every returned order. “Rather than accepting our return rates as a constant, we were able to challenge the widely accepted rate and reallocate the dollars budgeted towards returns to fund new programs and initiatives.” Kornfield added. For Brooks, optimizing beyond the conversion rate means focusing on the customer experience to protect the bottom line. It’s a shift from A/B testing to personalized experiences for different customer segments. Identify a meaningful segment, understand their behavior by asking who are my customer segments? What are they trying to do? Where is the experience falling short? The simplicity of the Optimizely interface allows us to be reactive and test against other eCommerce sites on a short timeline. We can see other sites change and quickly deploy a test to validate the concept against our audience.